Wildlife control is a fact of life for residents of Charleston and surrounding areas. Our beautiful section of the country offers a wonderful blend of urban and rural, city and wilderness. While that makes for a wonderful sense of natural beauty, it also means that we often have to deal with unwanted wildlife in and around our properties. At Advanced Termite and Pest Control, our safe, humane and effective wildlife removal services will keep you and your property protected. See our Rodent identification photos. Rats may be the only furry rodent that is more terrifying than a mouse. They are larger in size yet still have the ability to jump, swing and climb. The rat eats more in a day than the average mouse. Black Rats can cause structural damage or fire’s by chewing through cables. They also spread human diseases, such as: Leptospirosis, Salmonella, Listeria and Toxoplasma gondii. Mice are the most common rodent found in American homes. When it gets cold outside, they come inside. They are tiny acrobats that can invade pantries, drawers and climb on counters. Mice can feed up to twenty times per day. Aside from their annoying behavior, they are known to spread Hantavirus, Salmonella and over 100 other human pathogens. 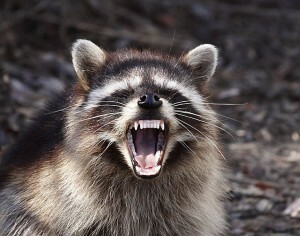 Racccoons are undoubtedly the cutest wildlife invader that comes to mind. They can be friendly and even playful. However they are known to carry Rabies, Baylisascaris infection and Raccoon Distemper. Furthermore, they are known invaders of attics, crawlspaces and can even get in between walls. They can cause a great amount of damage to insulation, wiring, and ductwork. According to the South Carolina DNR, there are thirty-eight species of snakes in our area. 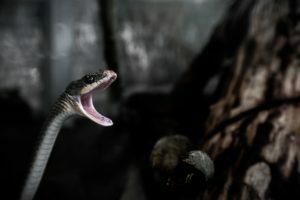 There are approximately six venomous types out of the many species. Those snakes include: Eastern Diamondback Rattlesnake, Timber Rattlesnake, Pigmy Rattlesnake, Copperhead, Cottonmouth, and the Coral Snake. Generally these slithery creatures won’t bother you unless engaged. However, it may be unnerving if they are frequent visitors around your pets or guests. If you’re currently dealing with a wildlife problem near your home or business, give us a call or send us a message for a consultation. We guarantee all of our work and we strive to make sure that every customer is 100% satisfied. We are equipped to deal with a wide range of wildlife control issues. If you’re having a problem with rats or mice, our extermination procedures will help make sure they’re gone and never come back. When it comes to larger animals, such as snakes, possums and raccoons, we are able to capture them alive and safely relocate them to the National Forest in Awendaw. Don’t let unwanted wildlife threaten your property or family.